Mordian 7th Regiment: Heresy Era Thousand Sons - Iskandar Khayon, take two! Heresy Era Thousand Sons - Iskandar Khayon, take two! Quick hit this morning - I was re-listening to Talon of Horus in audiobook form while painting yesterday (pics of that progress shortly! ), and thought it would be fun to take a quick break from painting and build a new version of Iskandar Khayon! Taking a modeling cue from the previous version, I started with the new plastic Ahriman model as a basis, swapped out the staff for Kayon's force axe Saern, and carved out the space for an alternate head and backpack. 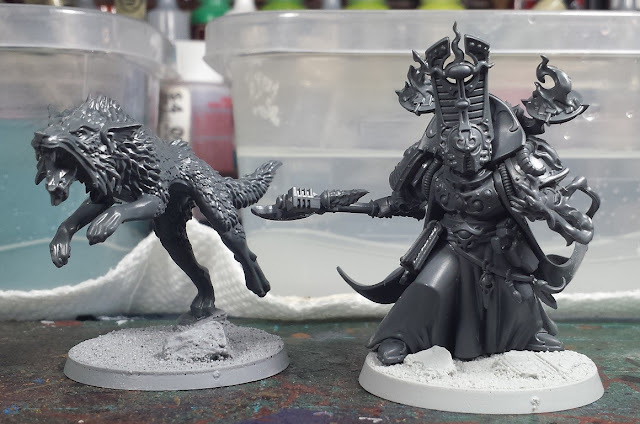 His daemon-wolf Gyre got a slight size reduction, and this time around I'll be painting her black-furred - I'd missed the reference to her color on the first read-through, doh! Suddenly feel compelled to purchase a second Ahriman, to use as an Exalted Sorcerer/Praetor. Very nice. Ahriman is a damn good mini. As a base for other sorcerora he's unbeatable. @Dave Henderson: I was quite please with the model, both arms are designed such that it's easy to swap them out, though the head required a little carving to replace! @Frothing Muppet: Indeed! 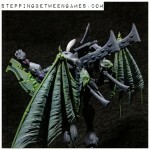 I love the witchfire coming off his left hand, and the pose is menacing! He looks awesome, the scale of the wolf is dead on. @NafNaf: Thanks man! He was a hoot to build! Using a Fenrisian wolf for a 1k sons'pet??? Heresy! @Dai: Hah! Gotta love the irony! @Joe B: Haha! Very cool! @Mospaeda: I went with a 40mm base, he'd probably fit on a 32 but feels a bit more balanced on a 40.